Thousands join in "Wooferendum" march to encourage public debate over Brexit deal. 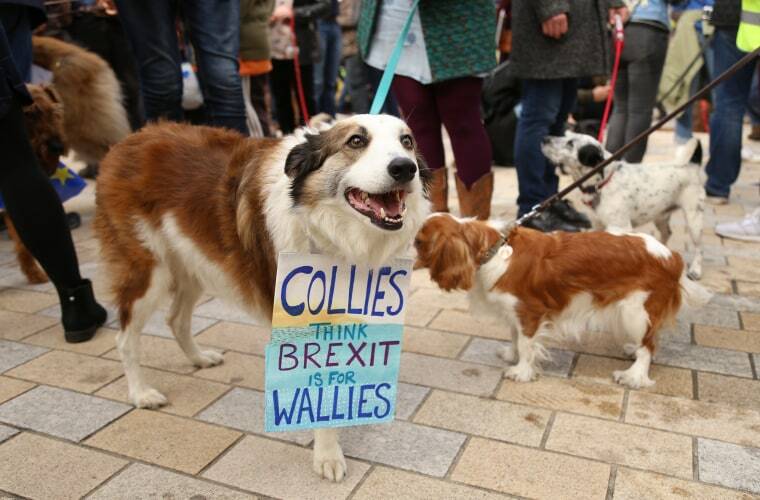 LONDON — From the tiniest terriers to a lumbering leonberger, hundreds of dogs led their owners to Westminster on Sunday to demand a final vote on Brexit in an event deemed a "Wooferendum." "I’m pretty convinced people aren’t going to want to support it now that they know what it looks like," said Madeleina Kay, 24, a strong proponent of the United Kingdom remaining in the European Union. Kay, who was named the Young European of the Year by the Schwarzkopf Foundation Young Europe, and her dog Alba were among the first to lead the march through London's streets barking, chanting and carrying placards — including one that read "We Will Not Be Muzzled." While the parade of pooches could be seen as trivializing the Brexit debate, organizer Daniel Elkan said incorporating animals helps soften an otherwise confrontational topic that can leave some people silent. “We’re generally not very good at expressing our feelings and we’re not great in this country at mobilizing and getting onto the streets," Elkan said. The march was an attempt to get people talking and add to the many calls — largely among anti-Brexit "remainers" — for the public to have a vote on whatever Brexit deal is agreed upon before it’s enacted. “It’s the democratic thing to do and it’s the sensible thing to do,” Elkan said. A second referendum isn’t beyond the realm of possibility. Less than six months before the Brexit deadline, there is no unity in Parliament over what the deal should look like and the public remains deeply divided over whether the country should remain or leave at all. NewsBrexit is just six months away. And neither backers nor foes are happy. Among the sticking points in the ongoing negotiations are how to avoid a hard border on the island of Ireland and how to conduct future trade. Finer details including access to medications and travel restrictions have the public concerned. "We don't know if we can travel to Europe with our dog next year," said Frances Beasley, 53. She currently takes her dog Dudley across the channel on holiday with her without concerns about quarantine requirements or lengthy paperwork — but it's unclear what the rules would be post-Brexit. Negotiations are ongoing and if a plan is reached in the coming weeks, it would be left to the 27 E.U. members and British parliament to both approve. The approval of the deal is not guaranteed either. “Parliament is clearly divided and I don’t think there is an obvious majority for anything,” said Alan Renwick, a political scientist and deputy director of the University College London’s Constitution Unit. The lack of political direction was echoed by Tom Brake, a Liberal Democrat, who told protesters, "This is not a done deal." He said outreach and demonstrations could have a significant impact on changing minds as the vote on the deal "is going to be incredibly close." While triggering a second referendum isn’t a widely favored option by politicians currently, Renwick said it may become the best option if no deal with the E.U. is reached or Westminster fails to support it. The only alternatives would be to hold a general election, extend the deadline for a deal or move forward with no deal at all. “None of those are very attractive,” Renwick said. The opposition Labour Party is split on the issue. May sought to exploit that division on Sunday by appealing to voters to look beyond party labels. She assured that her Conservative party will work for everyone, in an op-ed published by The Observer. But protesters took the political turmoil as a sign the decisive power over Brexit will be back in their hands. "Our Parliament is stuck, it's lost its way, and I think [Theresa May] is going to have to turn back to the people," said Cathy Erasmus, 66, walking her dog Trafford. Like Britain’s Parliament, polls suggest the public is also deeply split over the issue. John Curtice, political science professor at the University of Strathclyde, said the latest numbers tilt only slightly in favor of the remainers. The shift isn’t a result of Brexiteers changing their minds but those who didn’t vote at all having a preference to stay. “It’s pretty clear people are strongly committed to one side or the other,” Curtice said, adding it means a win for either side on a repeated referendum would depend on turnout. But Elkan believes people can be swayed, pointing to the emergence of the group Remainer Now, which is made up people who voted for Brexit and have since had a change of heart. “The more we talk about Brexit, the more we see the holes in it and the difficulties with it,” he said. A referendum wouldn’t resolve the dispute. Renwick said if politicians call for a vote by early December, the earliest the public could cast their ballots would be in May — requiring an extension of the March 29 deadline and drawing out the uncertainty.